Beautiful Barcelona | Turning my world upside down! 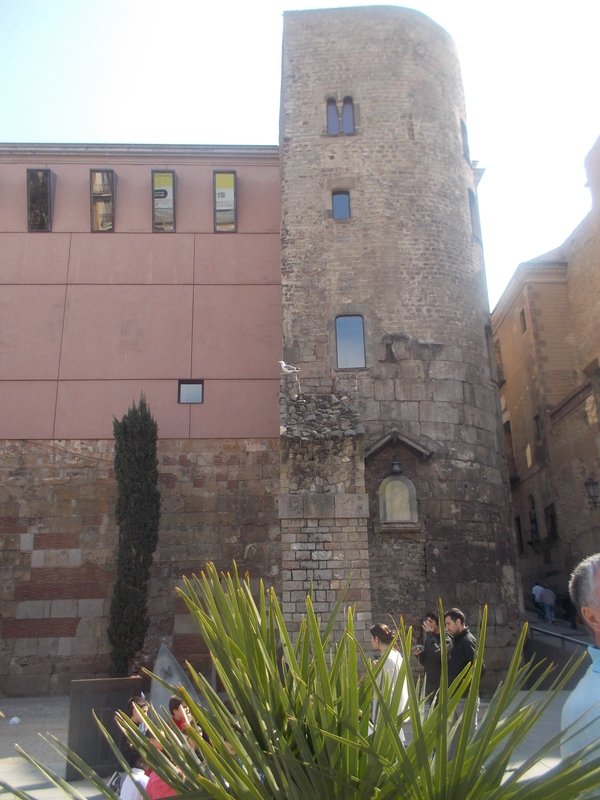 One of the 41 towers the Romans built around the city. Back from a great day of touring and walking. Ariane just got back from buying beer and wine. I was just having a chat with a nice guy who lives in Vancouver and designs video games. Before that I was chatting with a girl who works here on an internship. She is from Zagreb. We had a really good talk about the economy in Croatia. So refreshing to meet these educated young people. 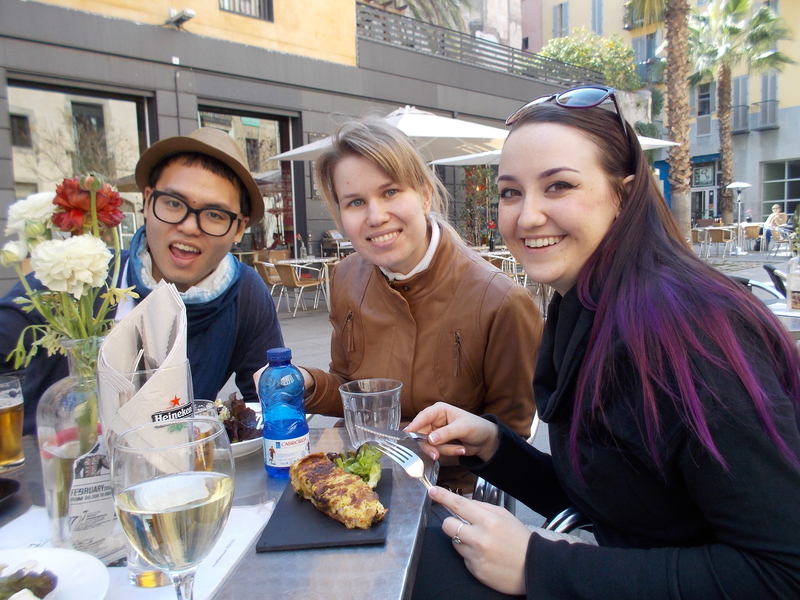 Had lunch in the El Born district, sidewalk café, with people from our tour. A girl from Russia who does risk assessment for a bank. The guy was a Korean who was in clothing manufacturing and export. His major customer was Walmart. He had a lot of fun seeing his clothing line in some of the Walmarts he had seen in the countries around here, I think. So we arrived in Barcelona on Sunday evening. I didn’t realize we had picked what is probably the best hostel in the city. The setting is an older building that was originally owned by a rich man who built 2 identical building for his daughters. The building eventually was noticed by 2 Israeli guys who seem to know what a hostel should be! Nothing is missing here. It’s comfy,friendly, lots of open areas to meet and mingle; they offer nightly food and entertainment, free coffee (of all flavours) at all times and breakfast is included. For about 60€ per night for 2 of us, we got a private double room with a bathroom. I swear the room is so newly renovated that I can smell the paint! And, our location is directly on the most expensive shopping street in the city, with the subway just steps away. The hostel is Casa Gracia Barcelona. You gotta stay here is you come to this city! Day 1 in Catalunya, we met Ariane’s friend Yanine In a typical Catalan restaurant in Las Ramblas, a touristy walking mall in town. We had a lovely time while I tried to practice my rusty, limited Spanish. After dinner, we got some much needed sleep. Let’s be clear here, dinner around here starts around 9pm, so we didn’t get back to our room until after midnite. Day 2 we decided to take a walking tour. We took the subway to Plaça Reial and moved on from there to see the many sights in the Barri Gothic, the old part of town. Notable was the Roman wall that surrounded the city at one point, some 41 towers in all, joined by stone walls. We saw the cathedral of Barcelona, Santa Eulalia, considered the patron saint of the city, a poor teenage girl who was tortured by the Romans for her Christian beliefs. We walked to the city hall area and past the museum of architecture, with a Picasso drawing copied from a napkin reproduced on the outside walls. We also saw a lot of the city’s scars, left by the anarchists during the Spanish civil war. Note to self, I must look up the Spanish Civil War and Franco. Lunch was at a café in the Plaça Reial with about 3000 soccer fans from Manchester. I didn’t realize before I was educated on this matter, that the English football fans are very loyal and will go to their team’s matches all over Europe. 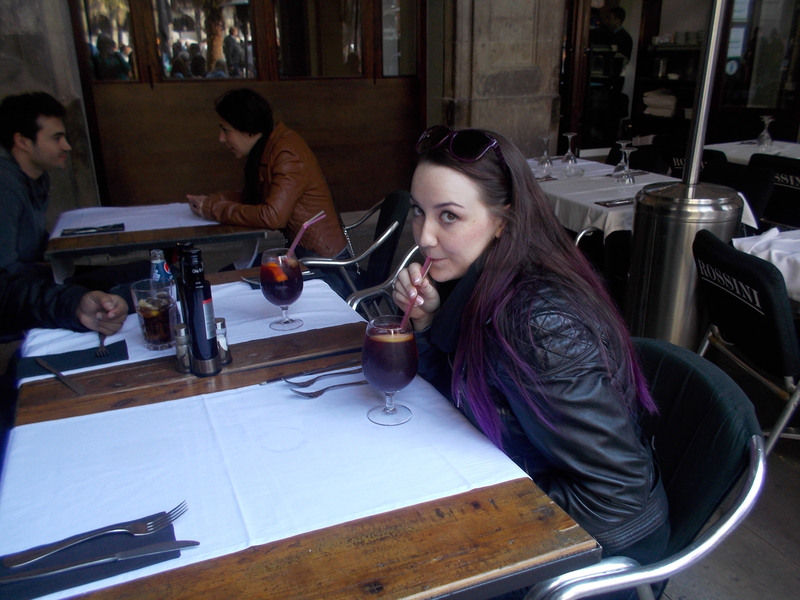 So here we were, trying to enjoy a nice lunch and sangria in the Plaça with thousands of noisy, excited fans. Lunch was nice, with me trying my first real paella, but it sure was noisy! Our new friend from Saudi Arabia told us he was barracking for Barcelona, so he didn’t dare speak up with all these Manchester fans. The city looking from the port. Picasso’s drawing from a napkins, used to decorate this building. The gang from the first walking tour.